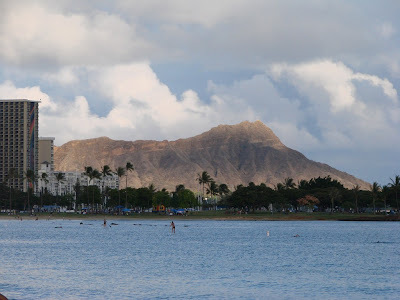 Here is a postcard like view of Diamond Head taken from Magic Island on Bob’s Full Moonwalk. I like the effects of the clouds in this picture which almost look like they were water-colored in though I promise this is an untouched photo. On the far left you can see the famous rainbow of the Hilton Hawaiian Hotel. In the water there are a few swimmers and paddle-boarders. Diamond Head is perhaps one of Hawaii’s greatest iconic image and the volcanic cinder cone is a United States State Monument. One of my goals on Bob’s Magic Island Full Moonwalk was to see if I could get a reflection picture off of the water. 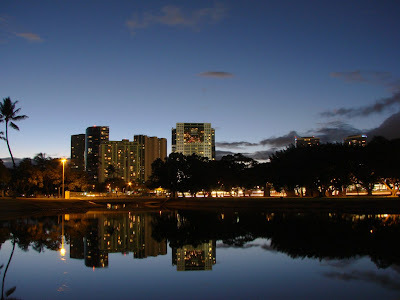 Shortly after sunset as we rounded the bend to head back to Magic Island I got this opportunity at Ala Moana Beach Park. There was still a little light left but I had to open the aperture in night mode and of course use a tripod for this shot. I was pretty pleased with the way it came out the only thing that could have made it better would be if the moon was in the picture but alas it had not risen yet. The golden hour (sometimes called the magic hour) which is the first and last hour of sunlight during the day is a great time to experiment with your camera and get some great pictures. 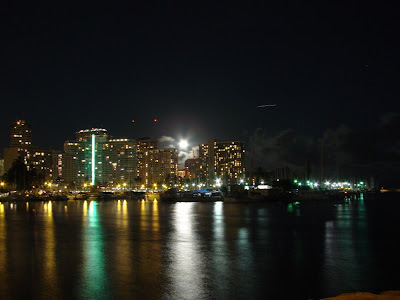 The moon rises over some of Waikiki’s buildings in this photo taken from Magic Island at Bob’s Full Moonwalk. Magic Island provides an excellent spot to get some great night views. This shot was taken just past 8:00pm. Each month Bob take a group of people on a moonwalk at a different location which provides a great way to get some exercise, take scenic photos, talk with old and new friends and of course see the full moon. I hope everybody had a great weekend now we all just gotta make it through the week before we celebrate the 4th of July weekend.